I've seen 14 episodes so far, and I couldn't be more amazed if I wanted to. 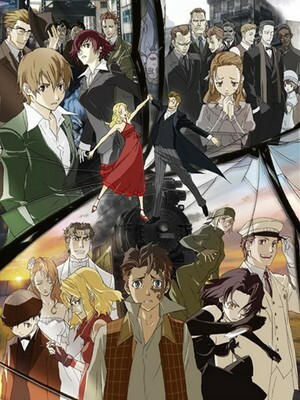 Baccano! is a prime example of excellent storytelling. Set in prohibition-era 1930s, there are a handful of people who are immortal. A robbery takes place on a train with several different murderous people on board. A mafia turf war is going on. An old man is out looking to re-create the elixir that grants eternal life. All of these events are connected and all of the characters involved are connected too, whether they realize it or not. There is no one main character, as numerous people are given just as much attention. The music is great. The action is great. The plot is gripping, and they deliver it in fragments for you to piece together. It originates from a series of light novels that I cannot wait to read. Disregard the way Funimation highlights the action in that trailer. It's just a marketing ploy to get people interested. There's much more TO the show than violence. Just give it a shot, you'll love it. wow I must watch that, I never heard of this anime until now thanks. I think I heard the name once (the stylized "A" looks very familiar) but never seen. Totally checking it out, thanks for the share! Page created in 0.859 seconds with 25 queries.